Rocking Horse Restorations was born in the middle of a ten year drought, to ward off depression, Libby Bailey began restoring old wooden rocking horses. 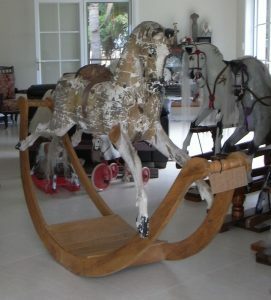 Over 11 years of restoration, the Baileys have put together an extensive collection of old wooden rocking horses and horse toys, some dating back 130 years. These horses have been found far and wide even coming from the UK and the US. 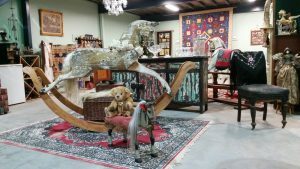 This is an outstanding collection of antique rocking horses and moving horse toys together with old farm tools, wood work tools, rabbit traps, horse gear and memorabilia from the surrounding area. This collection is housed in a purpose built facility and displayed in a beautifully decorated space. Fire places with antique mantles, old cots, sewing machines, quilts and china are part of the museum. A large sprawling garden with Major Mitchell Cockatoos are also part of the attraction.